SOLD INDIVIDUALLY. #6-32 hex nut. 7/64-inch tall, 5/16-inch width. Steel with zinc plating. Use with #6-32 machine screws. Replaces Bally/Williams # 4406-01117-00. 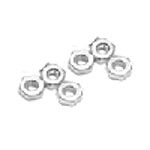 Commonly used on flipper bushings, coil brackets, and many other parts in most games. Keep a few on hand for quick repairs!